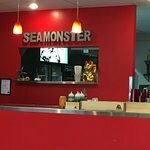 Description: Sea Monster is a fast service restaurant serving dishes from different parts of Asia with their spin on it. Meals are available for take-out and dine in. Limited seating is available inside, but during the warmer months there is a patio. I think this is what happens when Asian food is culturally appropriated. I totally get the respect and the love of the Asian noodle and rice bowls, and the decor is eclectic and fun. However, in executing this love for Asian food, the concept becomes a fuzzy stereotyped bland version of nothing specific. For example, steam buns, those lovely dim sum morsels make you think, ok, Chinese food. But then the rice bowls are those ubiquitous poke concoctions which frankly are Hawaiian not Japanese, right? Sczchewan Dan Dan noodles and Thai yellow curry soup. It’s all so confusing. In all honesty, I was a bit excited to try the best of all this, but unfortunately, everything was just bland. The yellow curry needed way more Unami (fish sauce?). My kids had plain noodles, rice, chicken and raw salmon with a side of the salted sweet cucumbers which were neither salty or sweet. The best part of the meal with the refreshing cucumber mint water. $75 for 3 adults and 2 kids. Very tasty food, very fast service. Steamed buns were delicious, the tuna in particular. Dan Dan Noodles Here We Come!! 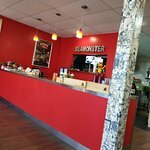 Read reviews from TripAdvisor and Toronto Star so went one day. 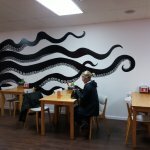 The Dan Dan Noodles was excellent...100% agreed with the reviews. Small menu but it fits our appetite. 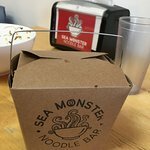 Who could resist the name Sea Monster Noodle Bar?! This little restaurant has a wide range of Asian - Canadian inspired meals & snacks. I had a tuna bun & serve of kimchee. 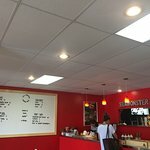 Using my discount coupon from Whaler's Point Hostel, my bill came to $8. Both items were delicious! They have indoor & outdoor seating. The shop's located 2 minutes from Jamie's bearing watching tours; convenient for a bite after you've worked up an appetite watching bears. The place is immaculately clean & the staff are friendly & efficient. The young man (recently from Toronto) who waited on us was exceptional. He was helpful in explaining the menu and went above and beyond to give us good service. The food was excellent - so much, in fact, that we went back the next night. The chef welcomed us back and the young man from Toronto remembered what we had ordered! We felt like regulars! The store was new and clean and well run. Everyone seemed to take a special interest in making sure things ran smoothly. Beware they close early - at 6:30. 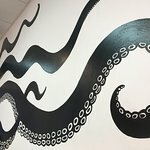 Been to Sea Monster Noodle Bar? Share your experiences!